Set of 9 colors with colorless blender pen. * Flexible brush tip and fine tip in one marker. * Brush tip works like a paintbrush to create fine medium or bold strokes; fine tip gives consistent lines. 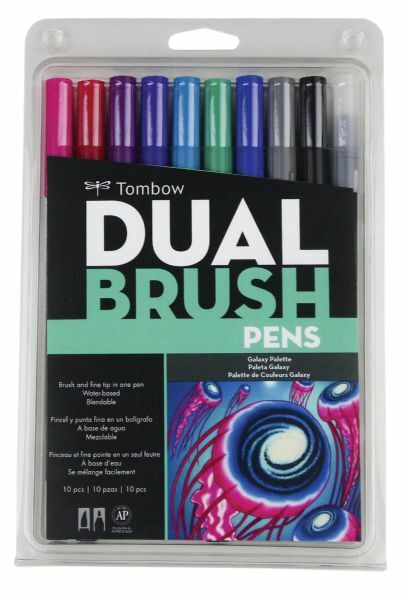 * Dual Brush Pens are ideal for artists and crafters. * The water-based ink is blendable and the resilient nylon brush retains it's point stroke after stroke. * Ideal for coloring fine art illustrations doodling journaling hand lettering and more. * Tips self-clean after blending. 8.9" x 5.9" x 0.5"